When I decided to revamp my website I opted to approach it in a different way than usual. I wanted to go back through the different organisations I have worked for, posting relevent work, but mainly talking about what I have learned and how it has made me the creative I am today. Joining in 2017, the day I got the call from BoF I was about to sign a contract with a major insurer to work in their Science department. Needless to say I wasn’t keen on going through another round of interviews but they persuaded me to come up to their offices in Fitzrovia and the moment I walked in the door I knew it was going to be my next role. I was employed at Senior UX Designer but it was clear that the company needed a whole lot of brand upgrades, the company had a simple and clean website but the marketing was rudimentary, the products such as BoF Professional, BoF Careers and BoF Education had no branding whatsoever and the general style needed to be revamped. We then moved on to revamping our company pages. If you buy a package to advertise your jobs on BoF Careers you get a company page where you can promote your business and showcase your company culture. These pages were built a long time ago and desperately needed a redesign so they performed better on mobile and gave the companies a better platform to promote themselves. Using OOUX techniques to identify the components we worked mobile first and create use cases, personas and wireframes. Particular attention was given to the edit flow which needed to be simple but sophisticated. The old pages were difficult to edit which meant that companies rarely came back to update their information, the new flow was simple and easy and has increased updateding enormously. The BoF iOS app is a member only exclusive but was built on web app technology and didn’t perform well. Last year we started working on a truly native solution that not only improved performance, brought the style of the app upon to date but allows us to scale. Eventually members will be able to manage their job applications, continue any Education courses they have subscribed to and much much more. I was made Design Director after 12 months with the business and as well as continuing with BAU I was tasked to build a design team that could manage the increasing level and quality of work that BoF requires as it expands. In the last 12 months I have hired a Mid-Weight Marketing Designer, a UX designer and an Art Director. On top of managing the team and programme managing all the projects in Monday. I am working on the BoF Design System. The entire design team is creating Brand Books, a Pattern Library, Presentation templates and event based assets so the company has all the tools to move forward with a consistent and confident brand. BoF has been the accumulation of everything I have learned in my 24 year career, but mainly it has been the holistic thinking that is needed for such a growing brand, the management skills needed to handle a design department and the vision to keep it all in the air and still moving forward. I contracted for a global education company to create a tool which at first seemed impossible to create. They publish hundreds of school textbooks for countries who all have different grading systems and syllabuses, the problem was that a huge amount of the work was overlapping and effort was being duplicated time and time again. They needed a tool to compare textbooks from one country with another. In short it was the most complex UX problem I’ve ever tackled and through the hard work of a multinational team, communicating every day via Skype we worked tirelessly to create a web based tool. It allowed us to put two different countries grading systems side by side and align them so that textbook editors could automatically reconfigure books to work in multiple countries. It literally saved them millions of dollars. An increbible contract, working with really talented people in a really short timeframe. When I was approached by First Freelance they had a brand style which had been designed for them and they had been using for sometime. Their brand needed some refining but mainly it needed greatly expanding. I worked to create a new colour palette and logo variations led to a full style guide of photography recommendations, social media templates and a completely new website. For a great deal of the time I worked in house collaborating with Mark and Carlo, the company’s leads to create a fast turn around on numerous projects. It just goes to show that when you are working with business owners who are passionate and motivated you can achieve so much more than working in an agency or remotely. The most beautiful thing about cinema is there is no shortage of stunning images to use. It was from this baseline that I completely redesigned the mobile and desktop experiences and at the same time incorporating a large CRM system for arts cinema Whirled. Using the ever changing imagery of that week’s movie I filled the screen much like the experience of going to the cinema and then let the content scroll over the top of the image and used it to create texture for the page. Working with the founders we identified the personas and streamlined the user journeys to allow existing members to quickly find out what was showing whilst at the same time enticing new members to join. I moved to Edinburgh to work for startup FreeAgent who create online accounting software that had rabidly passionate customers who pushed their NPS score up in the 60’s. I created a campaign to promote Freeagent to accountants to start using the software with their customers, saving them time and allowing them to do what did best, advising their clients on how to best structure their accounts rather than adding up receipts. We created a new sub-brand of FreeAgent, advertisements, event stands and other promotional material. I was introduced to Hamish at Bridebook by my good friend Aimee, who I worked with at Immediate. I worked with Hamish to create the UX for the new service which would combine wedding planning tools with an online directory of suppliers. We created personas, empathy maps and flows to work out the optimal experience baring in mind multiple people will be logging into one account, bride, groom and even the bride's mother. Numerous tools had to be designed, as well as a comprehensive search. I had been working on You and Your Wedding whilst at Immediate Media and this came in very handy, especially creating the search UX. Working with such a dynamic team who were incredibly engaged was a delight and the site went onto the be design by my very good friend Danielle Self. When I joined the company they had just acquired the BBC magazine contract. It was my job to bring proper UX methadologies to the sites to revamp the usability and increase the revenue whilst still promoting the magazine business. We created a distinct User Experience department, made platform wide changes to the sites and even created a carpeted user testing lab with a sofa and two way mirror. It was here that I fleshed out a great deal of my previous e-learning techniques to create Stakeholder interviews, UX research, Personas, Emotion Mapping, Wireframing & Prototyping, UI design and User Testing. Working on fascinating projects like the Radio Times iOS app and iPad Edition of the Christmas Issue it was never dull, even on the Gardeners World plant e-commerce site. I moved to IPC to work on the men’s lifestyle sites after initially redesigning NME.com. I moved onto working at Nuts.co.uk and worked in a team that took the site from 10 million to over 150 million page impressions a month and netting the business a million pounds a year. It was also the first time I worked on an agile project to re-design Mousebreaker.com which had been newly acquired by the business. We took a flash player and embedded it into a blank page and designed the website outward around it. In the early days off online ticket sales Livenation set up a web division to create sites for its live shows and festivals such as Wireless and Download. 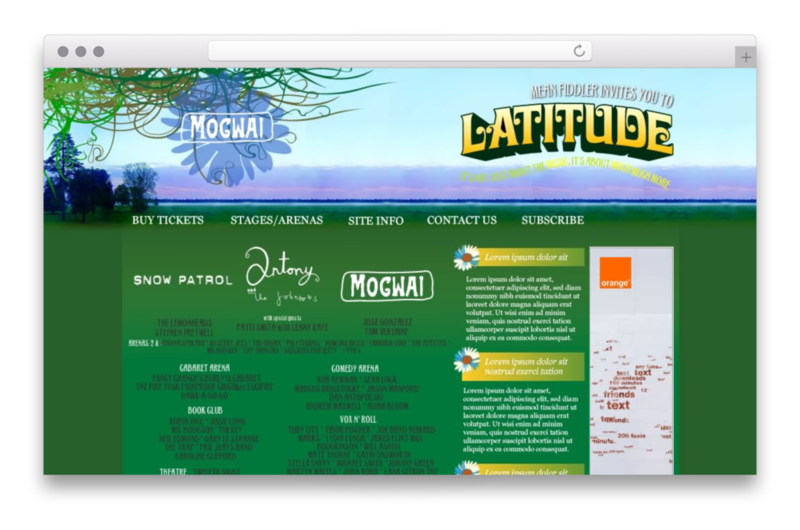 We created sites that advertised the festivals and allowed customers to buy online way before Glastonbury had a meaningful web presence and the explosion of the festival scene in the UK. I moved to Winchester to work on a treasury funded project between The Science Museum and a local sixth form college. We turned the Making The Modern World exhibit into a series of e-learning modules written by teachers for A-level students. This was my first foray into e-learning and also prototyping. Back then we didn’t call it User Experience but we created the wireframe in HTML. We also designed and build numerous e-learning assets in Flash and illustrated lots of infographics to compliment the text.